At sunset or sunrise the top edge of the sun will sometimes be bright green. Often, the green color lasts for a second, thus it is called a green flash. It is usually seen over a distant horizon such as an ocean or a prairie. The sky must be clear and free of clouds all the way down to the horizon. There are several different mechanisms that produce green flashes. 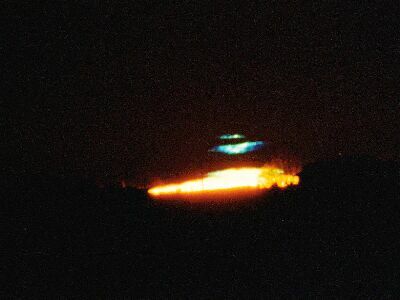 I’ll start with one common misconception that the green flash is due to a color afterimage then move on to a discussion of the atmospheric optics that produces the simplest Green Flash. The Green Flash is not an afterimage. 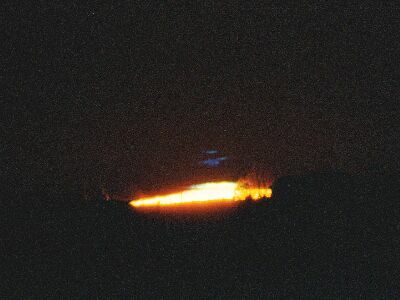 People speculated that the green flash was an after image due to the saturation of the red cones in the human retina, or that it was a continued phosphorescence of the atmosphere after the sun had set. However the observation of the green flash at sunrise made both of these ideas impossible. I was standing on Table Rock in the Linville Gorge Wilderness of North Carolina. It was just before dawn. I studied the eastern horizon and managed to spot a green flash at sunrise! Wow! Then the sun rose as a red ball including a rare naked eye sunspot! What a morning. The drive from Michigan had been well worth it. Light slows a little bit as it travels through the air of the atmosphere, at sea level the index of refraction of air is 1.0003, which says that light slows by 0.03% compared to its value in a vacuum. Lights from the sun travels through the vacuum of space and then enters the atmosphere of the earth. As the light enters the air it slows and refracts. At sunrise or sunset this means that the lights from the sun bends downward. Thus the image of the sun appears above where the image of the sun would appear if there were no atmosphere. The light is bent downward by 0.5 degree, exactly the diameter of the sun. So the image of the sun we see at sunset is tangent to the image of the sun we would see if there were no atmosphere. Just as the top edge of the sun’s atmosphere-less image is touching the horizon, the bottom edge of the sun’s image through the atmosphere is touching the horizon. The upper circle shows where you see the sun image at sunset due to atmospheric refraction. The lower circle shows where the sun would appear if the atmosphere of the earth were suddenly sucked away. The slowing of light depends on the wavelength of the light, its color. Blue light is closer to the ultraviolet resonances of the molecules and atoms which make up the atmosphere and so it is slowed more than red light. Thus blue light is bent more by the atmosphere than red light. The white image of the sun is actually made up of many different wavelengths of light. These different wavelength images of the sun will be bent by different angles. Thus the red image of the sun will appear below the green image which will appear below the blue image. The highest blue image of the sun and lowest red image combine with the central green image to create a white sun with a blue top rim and a red bottom rim. If you look through binoculars at Venus when it is low on the horizon you will see it separated into a spectrum of color blue on top, red at the bottom. When the sun sets all the images of the sun made by wavelengths shorter than green can be blocked by the horizon leaving the top edge of the green image visible. This is one type of green flash. What about the blue light? Well usually the atmosphere scatters blue light to the side more than green light or red light, so that the blue is removed and there is no blue flash. This separation of the sun into its spectrum happens at every sunset but the separation is so small that it normally cannot be seen by unaided eye. It requires optical help from refraction by layers in the atmosphere to make it easily visible. These same layers make mirages. Sometimes you will see mirage “puddles” on hot highways. These puddles are called inferior mirages, inferior in the sense of below, they appear below the observer. Inferior mirages are created when light refracts through the hot, low density, low index of refraction air near the earth’s surface. More rarely a layer of hot air will be above the ground, above a layer of cold air. This is called a temperature inversion and makes a superior mirage, a mirage that appears above the observer. The same temperature gradients that produce mirages can strongly influence the shape of the sun at sunset and the shape and duration of green flashes. A sunset through an atmospheric temperature gradient which would produce an inferior mirage causes the bottom of the sun to stretch down toward the horizon and broaden out. This occurs when cold air is over a warm ocean. These flashes are common over tropical oceans. They also happen over temperate oceans when cold air masses move south over warmer water. Most common green flashes are produced by inferior mirage enhancement. The average length of these green flashes in the tropics is 2 seconds. A sunset through a superior mirage pulls up the bottom of the sun and often produces a square shaped sun with horizontal fingers of light and dark penetrating the sides. This rarer condition can produce green flashes lasting over 10 seconds. Rarely, the atmosphere will be so clear that the blue light will not be scattered as much as usual. This leads to a rare blue flash. This extremely rare violet flash was photographed at sunrise in Boulder Colorado by Bill May. 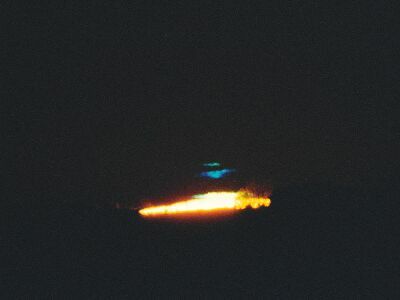 Here is a Blue Flash photographed by Bill May from his porch in Boulder Colorado. As the sun rises the blue flash becomes brighter saturating the color negative film. Bill May who took these photographs at sunrise from his porch in Boulder Colorado reports that he saw a violet flash followed by a blue flash with his eyes, these same colors were recorded on color negative film.